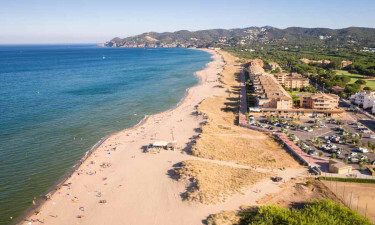 The luxury camping site of Playa Brava is located within the heart of the Costa Brava region of Catalonia. Besides offering immediate access to the cerulean blue waters of the Mediterranean Sea, this holiday camping site boasts splendid weather throughout the majority of the year. When we combine these features with modern mobile homes and state-of-the-art amenities, it is clear to appreciate why so many visitors flock to Playa Brava during every tourist season. As always, LUX-camp will be happy to provide further information upon request. 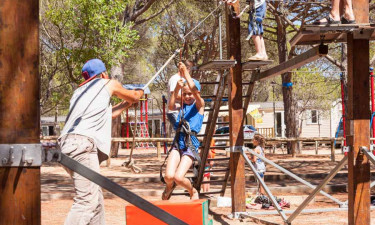 This camping holiday offers much more than modern conveniences. In fact, Playa Brava is found only a short distance away from the sea. Visitors can therefore enjoy immediate access to numerous aquatic activities. These include swimming, surfing, snorkelling and simply soaking up the inviting rays of the warm Mediterranean sun. Playa Brava takes the notion of luxury camping to the next level through the use of only the most modern facilities. Examples here will include (but are by no means limited to) baby-changing areas, washing machines and dryers, supervised playgrounds, car washes and disabled-friendly bathrooms. Wireless Internet is offered for each mobile home; perfect for keeping in touch with the outside world. This luxury camping site leaves little to the imagination in terms of the activities to experience during your stay. Face painting, arts and crafts and poolside games are ideal choices for those arriving here with children. Adults will likewise enjoy access to tennis, table tennis, basketball courts and even an "aquagym" to keep fit while decompressing from everyday life. Those who enjoy fine dining or a tasty cocktail before hitting the beach will be pleased with what Playa Brava has in store. 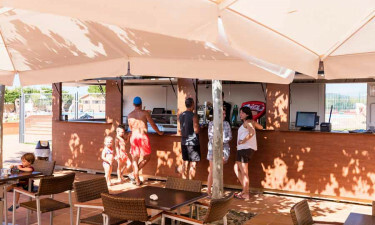 A combination bar-restaurant is open throughout the tourist season. This eatery is also equipped with an outside terrace – a great option to enjoy the nearby surroundings while dining. Local Catalan foods as well as international dishes are available and there is a takeaway menu. Child-friendly meals are provided. Roast chicken, paella, sumptuous meats and locally grown fish are all options here. Camping luxury is always associated with access to onsite shopping facilities. Playa Brava offers a grocery store that is able to cater to nearly every need imaginable. Fresh fruits, vegetables, frozen foods and baked bread are all offered here. Newspapers, magazines, travel guides and similar reading material can be purchased as well. Essential products such as toiletries and bottled gas are available upon request. So, all of the conveniences of home are found only moments away from every mobile home.